At the end of 2005 BHW received an emergency call from one of our partners - Andy Patching from Isubilo - in Zambia. 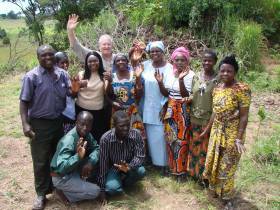 He knew a person in Solwezi, Zambia who was caring for 66 orphans and vulnerable children. Joseph Kampelembi and his wife had been sending these children to school but found they could not afford to pay the fees for the 2006 school year. Bright Hope World commenced sending funds for school fees and school requirements from 2006. In early 2008 the Bright Hope World Field Director visited the partnership, met the leadership team and heard the story first-hand. We also met and heard the life stories of many of the beneficiaries. We were amazed at the quality of the children that we talked to, speaking very good English and being very engaged in life. It was a testimony to the level of input that Joseph and his team were having into these vulnerable children. We have been in partnership with them since then, helping to send the children to school. Sadly, Joseph Kampelembi passed away in June 2015. Joseph was a real leader in his community. He had a huge heart for orphans and vulnerable people because of the hardship he grew up with himself. He was a refugee from the Congo and had many sad things happen to him there. Joseph has now passed the baton on to Martin Kawina and Johnathan Enoka so that this partnership can continue to look after the vulnerable in the community. The immediate beneficiaries currently are the 32 children who are enabled to go to school. This is from a list of over 200 orphans they have on their books in the region. They have to select the most vulnerable cases to help. Indirectly their guardians are benefiting also. Martin is a secondary school teacher who we first met in 2009. Joseph always used to point at Martin and say “This is my spiritual son”. Martin does a lot of work at the secondary school where there are 12 orphans attending. He runs a bible study with these children every week, and helps teach them things of life. It is obvious to see his care for these ones. 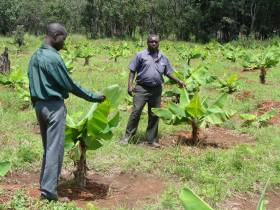 He has also helped them to have a small plot of land near the school that they work in, learning about farming. Martin has his own field, were he practices Foundations for Farming methods. His yields have been very good compared to what he used to get. We have only met Johnathan once but he is a humble man, making his living through farming the land. 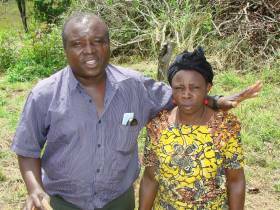 He has replaced Joseph as the head of the local churches in the Chisasa area. Joseph Kampelembi was born in 1953. When he was young he lived with his aunt and went to the Democratic Republic of Congo (Zaire). He had an extremely violent upbringing and there was always fighting at home. For seven years at home he suffered abuse, neglect, and a lack of food and clothes. No one took care of him. He remembers being chased out into the street at times. His uncle, who had a similar upbringing, took care of him for a short time, but he started fighting like his parents had done. His aunt then took him back but it got to a point where they threatened to cut his fingers off to “take his power“. When the other children were being fed, he would be sent away to do jobs, wash nappies etc, and by the time he got back all the food was gone and he would go hungry. When he was given clothes, he would be threatened not to damage them because he would get no more. When his clothes needed mending, he would try to fix them with wire. As a young man he moved to Zambia, where he met a young woman and they fell in love. He got married, unusually for the culture, when he was a still a very poor man. “I didn’t know why she married me, but she loved me.” They were married in 1970. Joseph and his wife had their first child in 1971, but the child died in 1978. In fact, their first four children died while they were serving in ministry. Joseph also lost both his parents. He and his wife began to notice the number of orphans in their community. They bought shorts and dresses and gave them to the orphans. They came across one small and sick child whose parents said if the child died they would eat it because of malnutrition. They took the child to hospital for four days. God heard their prayers and the child survived. He is now completing Grade 12, and they praise God for this turnaround. Joseph and his wife share all they have, they even give their own children’s clothes to the ones in need. They want to see these children on their own and coping well. The church they were leading started caring for children and then it started spreading to other areas. One day they met Andy and Eira Patching. Andy asked them about their orphan care work and started providing support for them. The major part of the current partnership is the payment of school fees for 32 children. There are more than 200 children registered so the current budget is at the bottom end of actual requirements. 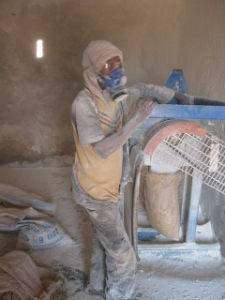 A grinding mill has been established and is currently doing well enough to break even most months. 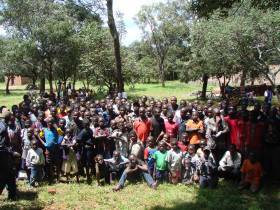 Some months there are funds left over to help with the orphans programme. In 2012 many of the board members and three students who had finished school went to Maplehurst farm for training in Foundations for Farming. They have since returned to the village to implement what they learnt, and to disciple others in the farming techniques. It is hoped that by increasing yields the guardians will be better able to support the orphans under their care, which is a major emphasis for Bright Hope World in such situations. The local committee is made up of people from various churches. The children being supported are from approximately 15 churches from seven different denominations. They are from a wide catchment area, more than 70 km apart.